Neisseria gonorrhoeae survives exposure to human neutrophils, but the mechanisms underlying this process are poorly understood. We are using a combination of cell biology, molecular biology, bacterial genetics, and biochemistry to reveal these mechanisms. Since N. gonorrhoeae is an obligate human pathogen, we use primary human neutrophils that are cultured to mimic the physiological state of neutrophils in the genitourinary tract of people with gonorrhea. We also have a collaboration with the Virginia Department of Health to collect neutrophils and associated bacteria from people with acute gonorrhea, which will provide in vivo relevance to our in vitro system. Gram stain of urethral gonorrheal exudate, showing neutrophils with associated gonococci. From Johnson and Criss, Frontiers in Microbiology 2011. How are neutrophils recruited during infection with N. gonorrhoeae? We have found that N. gonorrhoeae robustly infects polarized human urogenital epithelial cells and this is sufficient to drive the recruitment of neutrophils across these model epithelia, in the absence of any other immune cells. We are investigating the epithelial and bacterial factors coordinating this response and the consequence of transepithelial migration on the ability of neutrophils to respond to N. gonorrhoeae. How does N. gonorrhoeae survive inside human neutrophils? Analysis of neutrophils from patients with acute gonorrhea has suggested that the bacteria can live inside these otherwise antimicrobial cells. 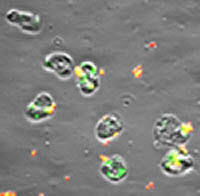 We have developed fluorescence-based microscopy assays for quantifying bacterial survival inside and outside of human neutrophils over time, which we are using to investigate where, when and how N. gonorrhoeae persists inside neutrophils. How does N. gonorrhoeae resist neutrophil antimicrobial activities? To date we have identified several N. gonorrhoeae gene products that defend the bacteria from neutrophils. We are conducting genome-wide screens to identify additional N. gonorrhoeae genes contributing to anti-neutrophil defense and are investigating the underlying mechanisms. How does N. gonorrhoeae suppress the neutrophil oxidative burst? Although neutrophils can generate reactive oxygen species (ROS) as part of their antimicrobial arsenal, we found that infection with certain strains of N. gonorrhoeae inhibits neutrophils from producing ROS. We are interested in mapping the bacterial and host factors that participate in this process. How do Neisserial opacity-associated (Opa) proteins modulate N. gonorrhoeae interactions with human neutrophils? The Opa proteins are a family of similar yet distinct outer-membrane proteins that interact with human heparan sulfate proteoglycans and/or carcinoembryonic antigen-related cell adhesion molecules. Each gene encoding an Opa protein is phase-variable, so a single N. gonorrhoeae bacterium can express no, one, or several Opa proteins. We are collaborating with Linda Columbus in the Department of Chemistry at UVA to explore the structure-function relationship between individual Opa proteins and human cells (http://www.columbuslabs.org/), using recombinant Opa proteins re-folded into liposomes and comparing their behavior to N. gonorrhoeae expressing the same Opa proteins. 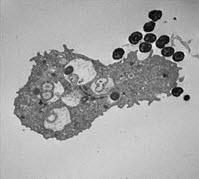 Thin-section transmission electron micrograph of N. gonorrhoeae-infected neutrophil. 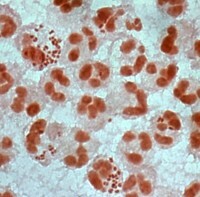 Human neutrophils bind and engulf N. gonorrhoeae. Bound bacteria are red/yellow, engulfed bacteria are green. Opacity phenotypes of colonies of N. gonorrhoeae. 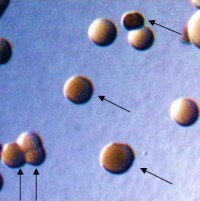 Arrows point to colonies of bacteria expressing Opa proteins. From Ball and Criss, Journal of Bacteriology 2013.